Interest in solar panels is growing among fleet managers because the main truck batteries are often no longer able to meet the power needs of today’s trucks due to increased driver comfort demands, and new idle-reduction legislation. Solar panels designed for the trucking industry are almost all flexible, thin, lightweight, and capable of being affixed to the curves of a tractor fairing. The main use of solar on tractors is to support battery HVAC systems and hotel loads without batteries. Solar panels can extend the runtime of battery HVAC systems, not only to help the HVAC system make it through the night without draining the truck’s batteries, but also to reduce the load on the alternator the next morning, resulting in fuel savings. Solar panels can augment the energy coming from the truck batteries and maintain the batteries at a higher state of charge extending the battery life and increasing driver comfort by allowing hotel loads to operate for longer periods of time. If the solar system can minimize engine idling while parked, all of that fuel savings goes directly to the payback of the solar system. A Battery HVAC system pairs well with solar systems. Solar can minimize the needs for roadside assistance calls for jump starts. When the truck is down for service or other needs, it is not unusual for refrigerators and other hotel loads to drain a battery. The use of solar to keep the batteries charged can reduce the expense and inconvenience of jump-starts and therefore unplanned downtime. Direct benefits are fairly minor, but solar panels can assist in keeping batteries charged especially when the engine is turned off. Keeping a proper state of charge may extend the life of a tractor’s main or auxiliary batteries. Solar can allow the refrigerator to remain on when the truck is not in use. This can be especially valuable to drivers to eliminate unloading and reloading the refrigerator during resets and weekends. Solar can also allow drivers to run some hotel loads, including battery HVAC systems, without idling during rest periods. The advantages of using solar power to keep refrigerators running and avoiding downtime (and therefore lost miles) waiting for jump starts can be valuable in keeping and finding new drivers. Solar and battery HVAC systems together can minimize engine idle time and therefore increase driver bonus opportunities. The aerodynamic curvature of the sleeper roof can be a limiting factor in mounting solar panels, though flexible panels are available for this purpose. With the shortage of available tractor-trailer parking, it is difficult to ensure that the solar panels can face directly into the most intense sun exposure. Latitude directly ties to the angle of the sun and length of solar exposure as well. Cloud levels vary by geographical regions so results with solar panels will definitely vary. The use of solar panels on tractors is too new and too low in penetration to determine the residual value at this time. Unfortunately it is also not easy to port the system from a current vehicle to a new vehicle. Although solar is relatively new, two of the seven tractors in NACFE’s 2017 Run on Less demonstration already had solar panels on the tractor and an additional vehicle had solar panels on its dedicated trailer. The latest generation of solar panels are flexible and have the wiring on the underside to make them more capable of being installed on the curved surfaces of a tractor with good durability. The study team developed several tools to help fleets in making their decision about solar panels. 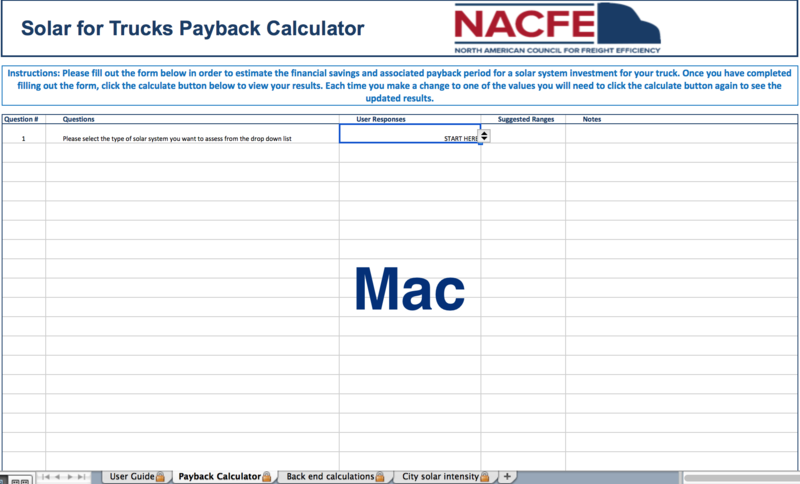 The payback calculator is an analysis tool designed to help fleets estimate the total savings and payback time of a tractor-mounted solar system, using their own data or best estimates. 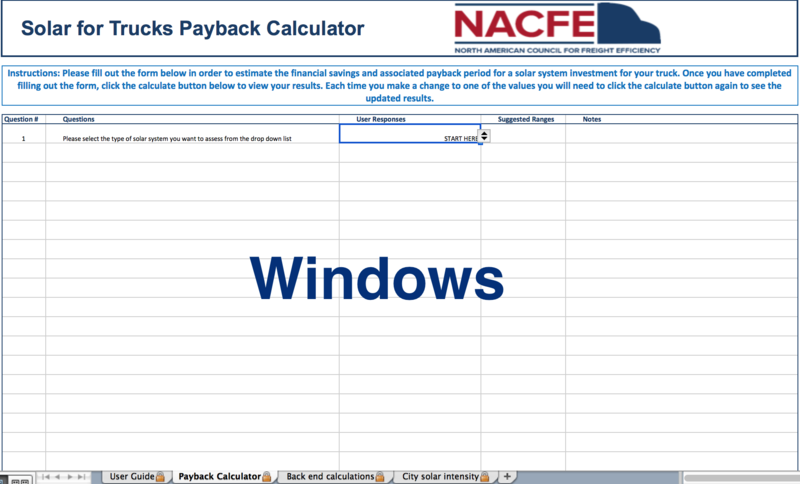 There is a version for Windows and a version for Mac users. 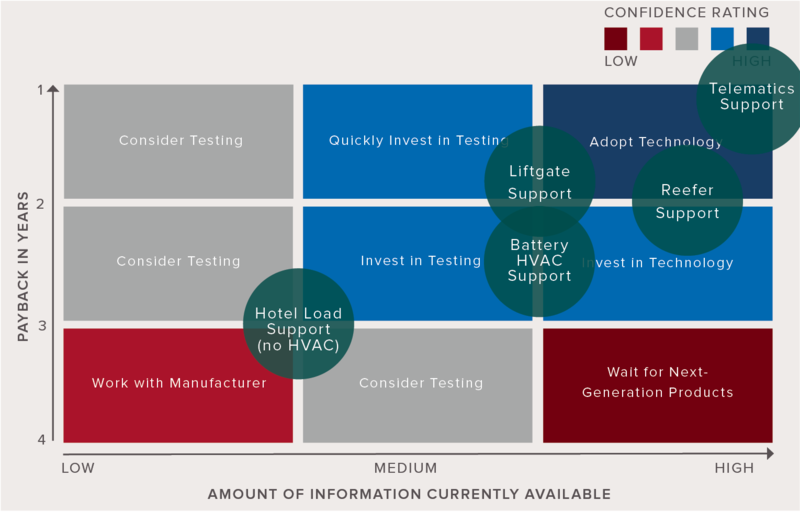 The confidence matrix is used to inform fleets of the study team’s confidence in the technology being studied vs. the payback a fleet should expect to receive from the technology. Solar technology for trucks has progressed to the point where the panels on the market are flexible, thin, easily installed and reliable. Some use cases are an excellent application of the technology and should be strongly considered for future purchases, while for other applications the cost vs. benefits should be evaluated to see if it makes sense in the specific application. Fuel savings are generally a very small part of the overall benefit that comes from a solar panel installation. Solar panel installations need to be sized appropriately for their intended application. There is limited hard evidence at this point from fleets that the payback from the investment in solar panels matches that claimed by the solar panel suppliers. Benefits fall in several categories with the biggest benefits being from extending battery life and avoiding emergency roadside assistance for dead batteries. The field of solar as applied to trucks is a constantly and rapidly evolving one. The future might lead to improved technologies, cost reductions, more electrification of trucking loads, and extended trade cycles, all of which would make solar systems even more attractive and cost-effective for fleets.